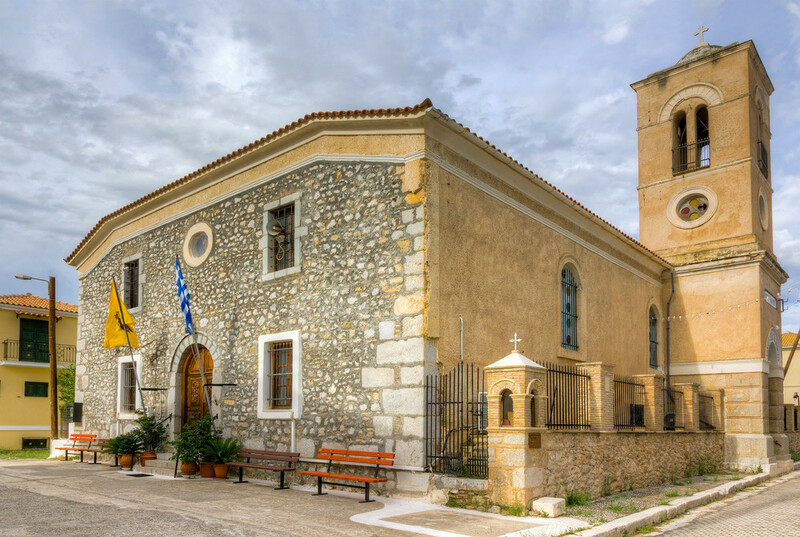 The oldest church in the city is Agia Paraskevi of Galaxidi. Its construction dates from the 17th century, while its temple was created in 1847 and it is carved from walnut. Agia Paraskevi of Galaxidi is a large and imposing church; its antiquity and humility impress those who choose to visit it. The unique element in Agia Paraskevi of Galaxidi, which makes it stand out among other churches of the Orthodox Church, is the solar calendar that visitors can see here. In 1911, the captain from Galaxidi Elias Skourtis, excellent connoisseur of astronomy, has carved in the marble floor of Agia Paraskevi of Galaxidi a zodiac circle – sunflower. With the help of a simple hole in the roof of the church was created the solar calendar: At 12 o’clock every day, through the specially made ​​hole in the roof of the temple, sneaks up a ray of the sun and shows exactly the date, on the zodiac circle! In the courtyard of Agia Paraskevi of Galaxidi, there is a solar clock, whose construction is also considered a sample of excellent technique.